Taj Mahal, admirably, is one of the most beautiful and architecturally magnificent monuments of the world, originally, is a tomb commissioned by Mughal emperor Shah Jahan in memory of his third queen, Mumtaz Mahal. The Taj Mahal, exhibits majestic admixture of Persian, Turkish and Indian architectural styles. The construction of this universally acclaimed architectural masterpiece started around 1632, under master artisans and architecture legends of Mughal empire Abd ul-Karim, Ma'mur Khan, Makramat Khan, Ustad Ahmad and thousands of master craftsmen. 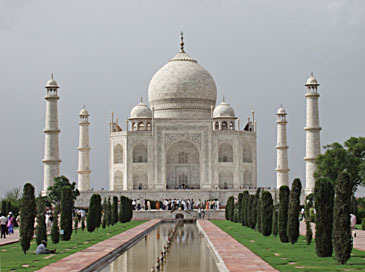 Taj Mahal is also one of the proud possessions from India in “Unesco World Heritage” site. The inspiration for Taj Mahal in designs and patterns also had been incorporated from the contemporary monuments and buildings of that era, like Timurid and Mughal buildings including; the Gur-e Amir-the tomb of Timur, in Samarkand), Humayun's Tomb, Itmad-Ud-Daulah's Tomb and Shah Jahan's creation Jama Masjid in Delhi. On the bank of river Yamuna, Taj Mahal was constructed on a- four acre piece- of land that was leveled to 50 meters above the river level. What is interesting to learn about this leveled platform, is its attachment to whopping 9.3 kilometer long tamped earth ramp, in order to transport material and other construction stuff to the site. The construction material for Taj Mahal was transported across from entire India and Asia and about 1,000 elephants were employed in this heavy transporting task. The entire structure of Taj Mahal, aestectically, and from the architectural value is constructed in four major division- Tomb, Exterior decoration, interior decoration and Garden.